There is more than one way to crochet amigurumi. Most often you make ami pieces by crocheting continuously in the round (rnd). You simply keep crocheting around and around, and the only way to know where a round ends and another begins is with the use of a stitch marker. But there is another way! 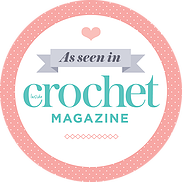 And if you have crocheted something in the round other than amigurumi (what!?) that was made using stitches larger than single crochet (what are those?! ), you likely used joined rounds. 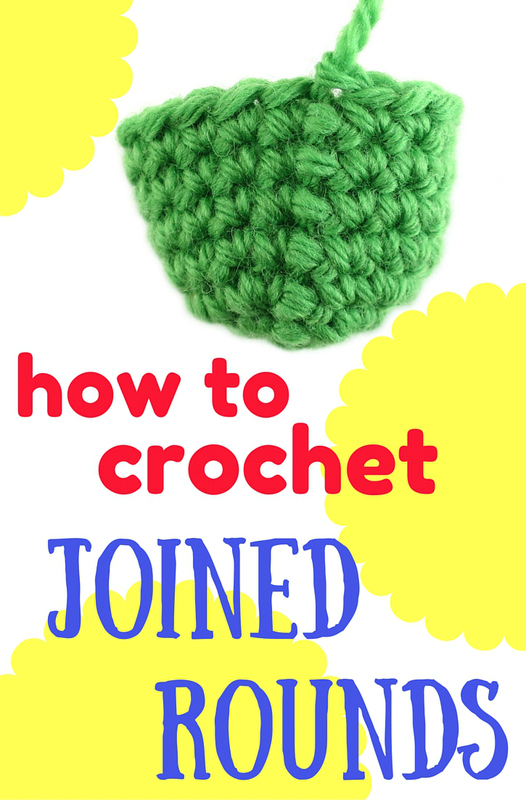 You can use joined rounds for single crochet in amigurumi, too! Working in joined rounds means you chain at the start of each round, and join the end of each round with a slip stitch into the first stitch of the round. Basically, at the start of each round you a making step up to the height of the stitch you are working with (so in the case of amigurumi, 1 ch for sc), then working around the piece, and then joining the end of the round to the start of the round to make a closed circle (don’t worry, I will demonstrate this with photos later!). Unlike with continuous rounds, the start of the round is at the same level as the end of the round. This has its advantages! One advantage is that your piece will end with an even, level plane, when it is complete. You don’t end up with a jog, or step up, like you do with continuous rounds. In some cases this makes for a prettier ami, depending on where the piece is located. Another advantage is with colour changes. When you make stripes with continuous rounds, so you are changing colours between rounds, that silly jog appears and makes your stripes less pretty. With joined rounds, because the start of the round is the same height as the end of the round, your stripes are nicer. With joined rounds, you don’t need to worry about using a stitch marker like you do for continuous rounds. You know when you have reached the end of the round because you are back at the slip stitch from the previous round and the chain stitch you started with! BUT there are some cons to this method, too. Some people don’t like the seam that is made by the horizontal joining slip stitches. It is quite noticeable, but in some cases the seam can be hidden, or it can simply add to the design of the piece. The technique is also a bit trickier to learn than continuous rounds. You need to learn to read your stitches so that you skip the joining slip stitch and initial chain – you don’t want to crochet into them, adding extra stitches to your rounds! How do you crochet joined rounds in amigurumi? I have learned two different ways to make joined rounds in amigurumi. One method is the most common, basic method for joined rounds, while the second method was developed by June of PlanetJune. If you don’t mind some seam action on your ami, then I would just go with the basic method (the method I will show here). If you are a perfectionist, I would read through my basic method first so you have the basics (haha! ), then head on over to June’s website and learn her method: www.planetjune.com/stripes. While her tutorial is on making perfect stripes, her second, no-cut join method, can be applied to joined rounds without a colour change to minimize the seam. NOTE: When starting with a magic ring, you do the same steps. Make your magic ring, ch 1 (just as you normally do even with continuous rounds), sc into the magic ring the number of stitches indicated in the pattern, tighten the ring, then finish by slst into the first sc made into the ring. Continue as above, starting with a ch, for the next round. TIP: If you are having difficulty identifying either the slst or ch and keep crocheting into it by mistake, mark it with a stitch marker so you can recognize it right away! When working in the back loop only (BLO), a method I often use in my patterns, the steps are the same as above, just which loops you crochet into differs. Make your joining slip stitch into BOTH LOOPS (photos a & b), but make all the sc stitches in BLO (photos c & d). This makes the joining slst more level with the front loops of the rest of the rnd, making the seam less noticeable. For a tutorial on how I make colour changes and stripes in joined rounds when crocheting in both loops and blo, visit here: stripes and colour changes in joined rounds. < Previous Movember – crochet a mustache! Thank you! I am just beginning armigurumi and started looking for joined rounds and found yours. I just can’t get into marking or joined rounds! I do love your clear tutorials filled with lovely photos. Thanks for taking the time to write this! Yay! Glad it was helpful for you 🙂 I remember reading my first pattern with joined rounds (it was a Japanese pattern with diagrams) and I had no idea why they used them or what to do! It was very frustrating. I think I ended up just using continuous rounds anyway! I am having some trouble with working in the round. Doilies were easier, but not nearly so much fun!